Setting up our touch tank! 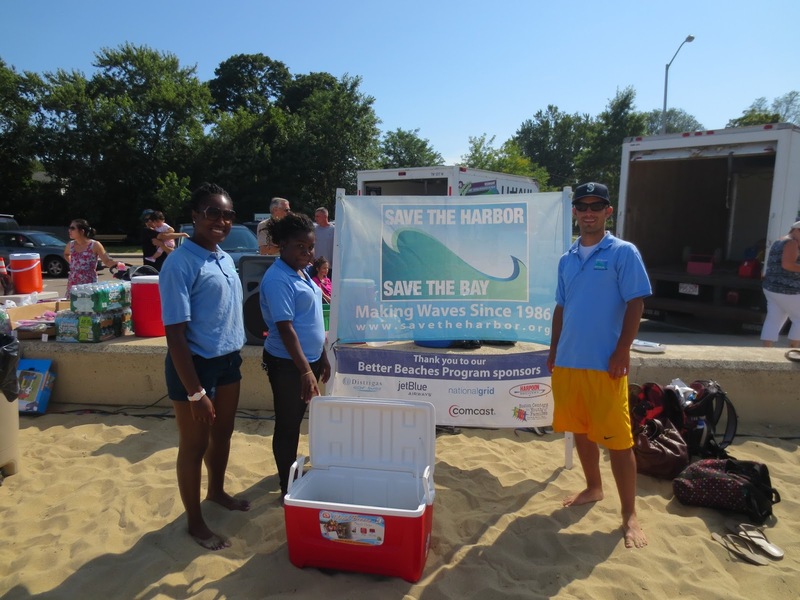 Last weekend I was part of the Friends of Wollaston Beach KidsFest event. 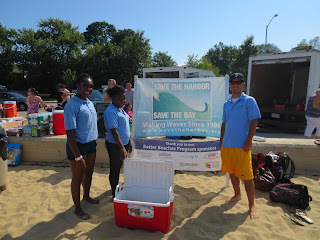 Upon arriving to Wollaston Beach I was greeted by Neil McCole who is the head of the Friends of Wollaston Beach group. We set up our touch tank to include Larry the Lobster, a green crab, clams, a razor clam, hermit crabs, and periwinkles. 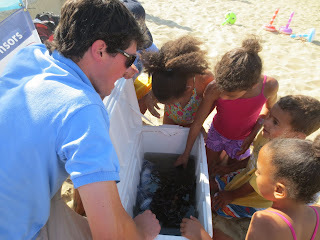 By the time we were done setting up the touch tank, the rest of the beach was over taken by loads of kids. 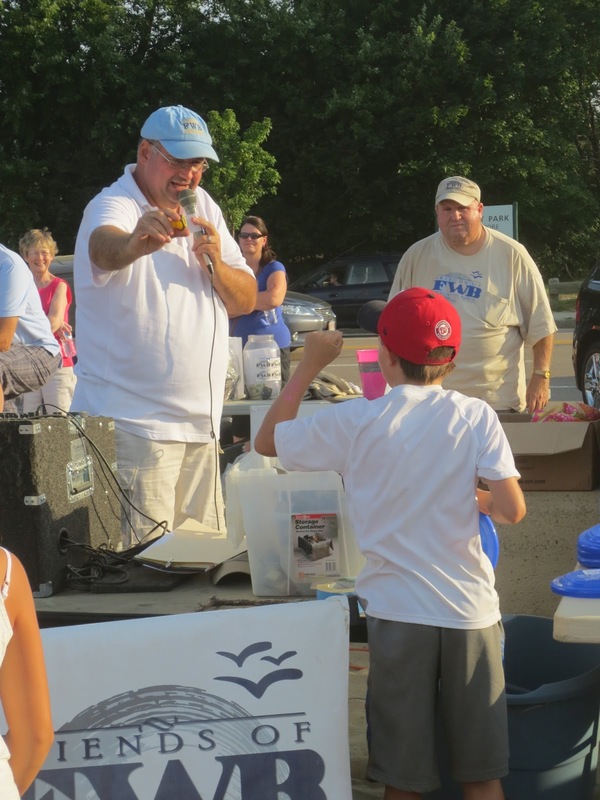 Along with our touch tank we helped out with the various of activities that were planned for the event. Activities included: the Football toss, the frisbee toss, and potato sack races. After each game the winners were called up to the front table to claim their prize. Music played during the entire KidsFest. One of the main attractions of the event was the annual duck hunt. In the ocean were a bunch of rubber ducks that had numbers written on the bottom of them. Each kid ran into the ocean to grab a duck and then waited for Mr. McCole to call a number. Once Neil McCole called the lucky number one little boy ended up winning a Kindle Fire HD tablet. Now came time for the marble hunt in which all the kids were searching Wollaston Beach to find a blue and while marble. If they found one of those precious marbles, they would be entered to win a round trip ticket on Jet Blue to fly any where in the United States. After that it was time to wrap up for the day. What better way to end the event than to have a dance party on the beach! Overall, it was a great event that brought a community of families together. No better way to spend aa summer afternoon than by having a big party on the beach. See ya' next time when I blog about my adventures on Peddocks Island!